Business Certificates – 12 certificates for various uses in a business or organization. You’ll get 12 certificates to use for a variety of reasons. 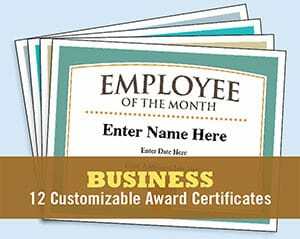 Recognize your boss, colleagues and others at various times with: “Employee of the Month” certificate “Happy Birthday” certificate, “Thank You” certificate, “Certificate of Excellence” certificate, “You’re an All-Star” certificate, “You’re Awesome” certificate, and others. When you purchase you’ll receive a PDF file that can be used on Mac’s or PC’s. Use them year-after-year for all different occasions – it’s a great deal! 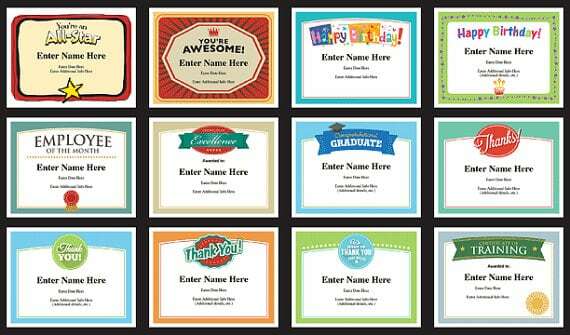 Personalize these kid award certificates templates with a person’s names, the date, and your own words of praise. Designs are set to work on standard 8.5” x 11” paper. Fun, stylish and a lasting keepsake for your friends and colleagues at work. • Put a smile on your friends and colleagues faces! Who doesn’t like a little recognition? Folks love these certificates. Reward people at key moments with these special certificates. It will create a lasting impression. • Professionally designed. They’ll look good on the fridge, cubicle wall or bulletin board. 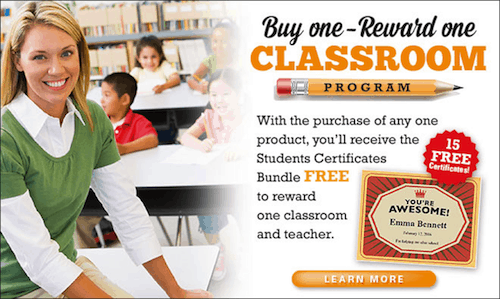 Purchase the Business Certificates Templates, or any product from our store, and receive the Classroom Bundle FREE! You’ll have these certificates on hand, year after year, to print off and present to well deserving folks in the office. While they’re easy to use, the look is well designed and professional. People will enjoy receiving these. Boost employee morale by recognizing achievement.